Five years ago, I would have sold you my house for a dressy pair of shoes that I could actually wear without smack, smack, smacking my way into malls and restaurants. Texas is hot. All 120 degrees of it some days, and there is not a dry toe in town. My wish was that one day, cute summer shoes could feel like I never took my socks off. So I walked into my local shoe cobbler with a sheet of fabric and arms full of expensive sandals. “I’d like you to glue this to these.” I said.oms, dads, business people and teenagers. Our advisory board is a true treasure – a podiatrist, dermatologist, textile expert, hyperhidrosis patients, and fashionista friends. We listen to every comment, and we incorporate thoughts and suggestions nearly immediately as we shape, transform and bring your wishes to life. My team even put our Farm Fresh Scrubs to the test with men and knew we hit the jackpot when they admitted to using it like soap every morning. Of course, we’re also “sole” benefactors of our products… there’s not a shoe in our closets without a Summer Sole in them. I hope these little fabric dreams will change your life, as they have mine. Summer Soles, LLC. is a foot care innovator, offering “Summer Soles” – chic, one-of-a-kind fabric insoles uniquely designed for use in sandals and other open shoes to put an end to the general “slippery discomfort” often experienced with summer footwear. These removable strips are the first open shoe liners designed specifically for those who want discreet, stay-dry comfort, particularly the millions of people who suffer fromplantar hyperhidrosis – sweaty feet. They are also for the untold millions who simply hate ‘shoe squish’. Whether it’s shoe squish, slip or slosh you’re remedying, Summer Soles are pure paradise for little piggies everywhere. Shannon McLinden graduated with her MBA at the young age of 21, from Texas Christian University. In 2001, she founded Wow Media Group, an advertising agency in Dallas, Texas. 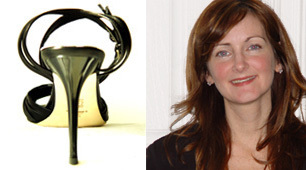 In 2004, she began working with manufacturers to develop the perfect sweaty-fix for sandals and open shoes. Philanthropy is a staple of Shannon’s life. She is a motivational speaker for teens and is the author of a book, The Me Nobody Knew, published in 1998, which details the struggles and triumphs of overcoming her teen years. Today, it is sold in two languages: English and Taiwanese, and is used as curriculum in middle school, high school and college classes throughout the U.S. and Canada. She connects with kids through her website: allaboutus.com. Today she is bringing squishy-sandal relief to people all over the world throughSummerSoles.com, and is still writing and speaking in schools.